This is a great introduction to the sport of powered paragliding. It shows what to expect from first lessons, first solo flight, to advanced techniques. This program has spectacular in-air footage and great soundtrack. "Realize your dream of flying with the simplest and lightest form of powered aviation available today." That is the message of the latest video from Paul Hamilton and Adventure Productions. It was created to introduce a person to ultralight flying fundamentals and how modern technologies plus enhanced training techniques have made learning to fly easier than ever before. 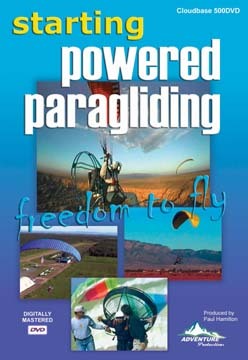 "Starting Powered Paragliding, Freedom to Fly", is educational - featuring the fundamentals of the sport, plus entertaining -- with stunning visuals and a great stereo sound track. It will answer all of the questions a person has about learning to fly an ultralight powered paraglider. The video's inspiring imagery was filmed in New Mexico, Florida, Canada, France and Italy. This program can also be used to present the positive aspects of ultralight flying, the basics, and show what to expect in a modern training program." says Paul Hamilton. "It is a great tool for schools to use in recruiting more students and incorporate it into their lesson package. The video will help instructors save time and be more effective in the overall training process, plus help students learn faster with all the basics presented. The video begins with an introduction to modern Powered Paragliders, foot launching, taking off on wheels, and safety concepts. Testimonials from pilots and instructors effectively communicate the "freedom to fly" feeling and how flying powered paragliders can satisfy everyone's dreams of flight. The program then moves into the basic building blocks of learning to fly Powered Paragliders beginning with ground handling the wing and getting familiar with motor pack on a simulator. Then on to the final ground school for the first solo flight. Beginner pilot basics are covered with animation to illustrate power settings and how the Paraglider reacts, as well as, the basic flight pattern for Powered Paragliders. Important safety aspects such as weather, engine out and mechanical air turbulence are touched upon and recommended for intermediate pilot studies, as are weather data and pilot judgment. Wing and motor pack fundamentals are explained to provide an understanding the different options for equipment. The final message, "The time is right, the time is now, start powered paragliding, Today!" will inspire anyone who has ever dreamed of flying free, to sign up for lessons today.